The intersection of Grove and Van Ness, where two people have died in 2014. Four people have been killed by cars on Van Ness Avenue in 2014 – more than half of the pedestrian deaths in San Francisco this year. One ran into traffic after an argument. Another was a hit and run. One didn’t appear to use a crosswalk. Stories like that seem to support the idea that pedestrians are often to blame. But in San Francisco, motorists are at fault in almost two-thirds of pedestrian collisions. Nicole Schneider is the director of the pedestrian advocacy group Walk San Francisco. “Our streets are failing us. We've had 21 people die last year,” says Schneider. Schneider says three people get hit by cars each day. Most of those collisions happen on just six percent of San Francisco streets. Nicole Schneider is standing at the corner of Van Ness and Grove, right in the shadow of San Francisco City Hall. It’s morning rush hour and cars are speeding by. Cars swerve around stopped buses and people dart out into busy the street. Schneider says that on Van Ness, looking both ways before you cross the street is not enough. “Van Ness is particularly dangerous because as you can see, we're standing here, if I were to cross, I’d have to cross seven lanes of traffic,” she says. 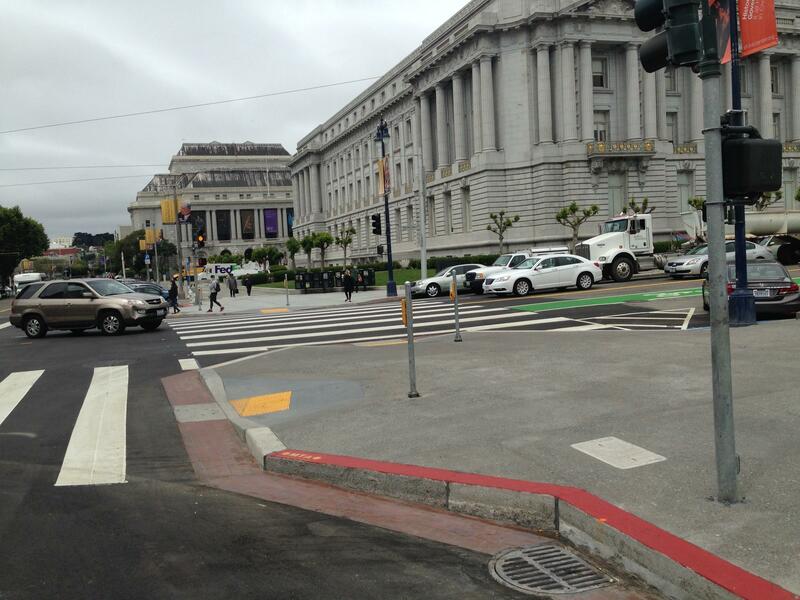 This year, two of the four people killed on Van Ness died in this intersection. Schneider says it’s not hard to see why: for one thing, there’s no median in the middle of the street. “You can see from this lady, she started crossing, a woman just crossed the street and she started crossing when the light turned and she didn't make it across, she's an elderly woman, she didn't make it across before the light changed,” she says. 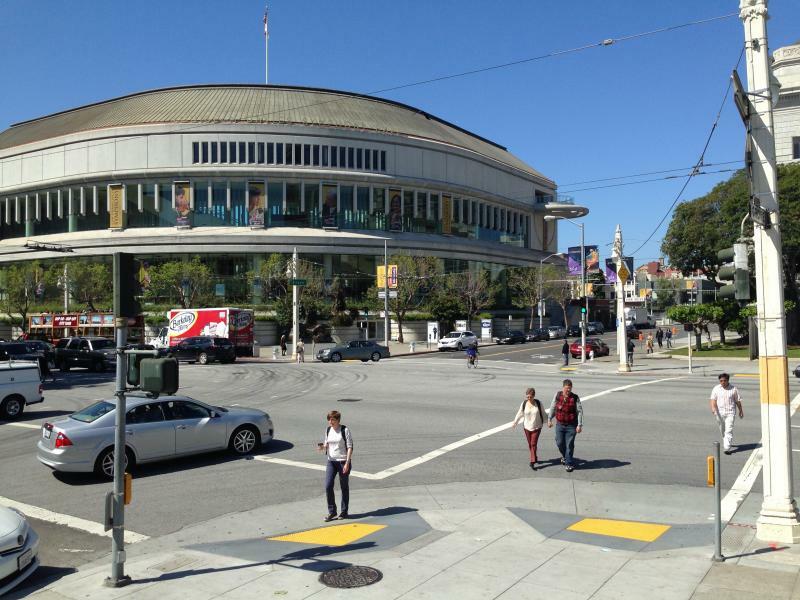 The crosswalk signal at Van Ness lasts about 30 seconds. Schneider has spent a lot of time cataloguing the problems on Van Ness. The biggest one, she says, is speed. It feels like a freeway street because it is a freeway street. Van Ness is technically California Highway 101 up until the Golden Gate Bridge. Speed is a major factor in fatal collisions. If you hit someone going 40 miles per hour, there’s an 85 percent chance they will die. At 20, the fatality rate is only five percent. The average speed on Van Ness is between 21 and 24 miles per hour during the day-- the speed limit is 25. But there’s no data on speeds late at night, when cars tend to go faster. Three of the four people who were killed on Van Ness this year were struck in the middle of the night. Ricardo Olea from the Municipal Transportation Agency, or MTA, is San Francisco’s head traffic engineer. He and other city officials are trying to cut down on pedestrian collisions. Standing at Polk and Grove, one block away from Van Ness, Olea describes some recent pedestrian improvements at the intersection. An upgraded intersection at Grove and Polk. The MTA extended the sidewalks by 16 feet, which shaves four to five seconds off the crossing time. The MTA has undertaken a lot of lower-cost projects similar to the ones at Polk and Grove, and lowering speed limits. It’s all part of Vision Zero, a plan to eliminate all traffic deaths – pedestrian, bicycle, car, and motorcycle – by 2024. Olea says he looks for patterns in collisions at different intersections, and makes specific recommendations. But changes aren’t coming to Van Ness because the street is going to get a big makeover in the next few years with the Van Ness Bus Rapid Transit project. San Francisco will re-design the whole street, creating bus-only lanes and adding pedestrian-friendly improvements like bigger medians while they’re at it. It was supposed to be done two years ago, but after some delays, it’s projected to be finished by 2018. It won’t be a minute too soon for Nicole Schneider, who points out a dangerous situation at Van Ness and Grove. San Francisco has a whole slew of plans for longer-term projects besides the Bus Rapid Transit project, plus enforcement plans officials say will help make Van Ness and the rest of the city safer – for everyone. But they say they don’t have the funding and are asking residents to pass a combination of bonds, sales tax increases and higher vehicle license fees worth almost three billion dollars to pay for it.